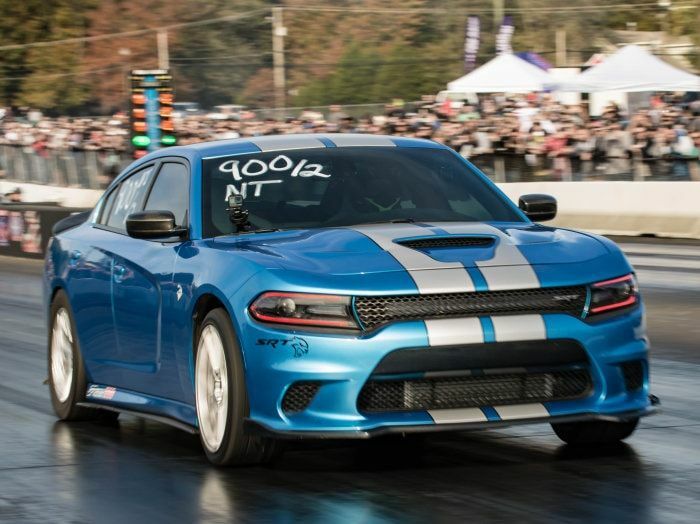 Over the course of the past two years, TorqueNews has worked with the members of the SRT Hellcat & Demon Group on Facebook to choose the Hellcat of the Month. The group of more than 16,500 members are asked to nominate five Hellcat cars that are owned by active members of the online community. Once those five Hellcat cars are chosen, the members are asked to vote on their favorite car of the five in the running. For the month of February 2018, we focused on the Hellcat Charger, alternating from one month to the next. Of the five supercharged sedans nominated by the community, the gorgeous metallic blue machine owned by Todd Fullford won by a margin of nearly two-to-one over second place, grabbing 55% of the votes while second place finished with 28%. After the members picked SRTMush’s Charger, we reached out to him for more information on his Hellcat sedan. As we do with all of our Hellcat of the Month winners, we asked SRTMush why he picked the Hellcat Charger, what he has done so far and what he plans to do with his 9-second sedan in the future. Below is his story. I had been waiting with little patience left for years while rumors of a "Hellcat" kept floating around the forums. Finally the Challenger Hellcat was announced, after all this anticipation, it was better than what I (and probably) most thought it was going to be. I wasn't totally sold on it though, mostly due to the fact that the body styling just wasn't drastic enough from the previous years. Then, boom, the new Charger Hellcat gets announced in Detroit. THAT'S what Ive been waiting for. At the time I had a 2008 Charger SRT making around 700hp, fully built. I was starting to get bored with the car, the looks, the performance. So the announcement of the new Charger Hellcat was perfect timing. It took me a few months to get my financials in order to be able to pull it off, so as soon as Jan 2016 rolled around, I started looking, and ended up finding exactly what I wanted (except the audio package) on a dealers lot. I swore I wasn't going to mod it, but that lasted 3 days, and haven't looked back. When they first came out everyone was doing the same exact thing, pulley and tune. All these Hellcats lined up at shows and meets, all look exactly the same, some with a few more HP than others. I just wanted to set out to stand out a little, and prove that you can do things like air suspension to a high performance car, and still retain the performance. The first major mod I did was bag the car, which gained a lot of praise, and hate. Perfect. Ultimately we wanted to first build something that would turn heads, and take to shows and try to win some awards. And then, build it to outperform most cars out there. There will always be someone faster, always, so we focused on that 2nd. As it sits now, it has simple bolt-ons; 2.5 pulley, full E85, injectors, Corsa exahust, JBA catless mids, tuned ourselves with HPTuners, DSS driveshaft, 3.09 rear, boost a pump, race heat exchanger, and rear diff brace. Ferrada forged wheels for the street. Airlift Performance air suspension. Abaza Custom carbon fiber body kit. Racing seats, harnesses, harness bar from CipherAuto, engine items from Billet Technology, and a bunch of other odds and ends. Our best time was out last day out last fall, it ran a 9.83 on the last tune revision we made. I think we can knock that down a little further with the same set up this year and a little more tuning. We plan to swap out to a better wheel and tire package for the strip as well. We will be racing the Hellcat and our Demon all season against each other. Not saying it IS going to happen, but we would like one of them to run 8s this year. Racing 1 car is hard enough, racing 2, might be too much. But we will see what happens! We have worked with some awesome companies and people this past year on the hellcat, and already have many things in motion for the Demon, and the Hellcat for 2018. If you want to follow along all the racing this year, we will be putting videos up weekly on YouTube. Come ride with us! Thanks for all the votes on the Hellcat of the Month, Mopar fam! So, from everyone at TorqueNews and the Hellcat & Demon Group Facebook page, congratulations to SRTMush and his 2016 Dodge Charger SRT Hellcat for being the Hellcat of the Month for February 2018.